« Billboard face to launch a million votes? Published on January 2, 2015 in General T&T and Protest. 2 Comments Tags: Politics, Stephen Kangal, T&T Govt. Villagers of Frederick Settlement undertook a placard demonstration on 22 December 2014 to highlight the problems that originated from the building of the New Southern Main Road. 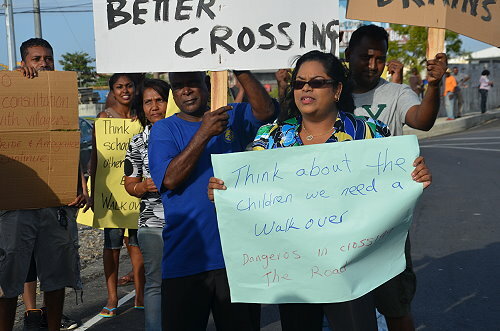 A decision on the demonstration was taken at the end of the Meeting of Residents held on Thursday last (18 December) at the Frederick Settlement Community Centre based on the statements made by the residents expressing fears for the safety of their children while crossing the dualled and expanded roadway as well as the absence of Minister Rambachan from the Meeting although invited. The inadequacy of the lighting/ relevant signage on the new road causing severe difficulties in navigating the road during night time by both residents and other drivers using the road. This is a threat to life and limb and a clear violation of the CEC stipulations. Difficulties and dangers being suffered by the residents in the crossing of the roadway that is now very wide with two unlit lanes/carriageways and no pedestrian crossing lights even temporary zebra crossing marks. The complete absence of U-Turns even though the new road is wide enough to accommodate a third lane for such purposes at the entrance to the Industrial Zone and at the entrance to La Paille Gardens resulting in unnecessary long, time-delaying journeys to the Caroni Roundabout and the Distillery Roundabout especially at morning and evening rush hours. We were assured that U-Turns will be included at these points by PURE during meetings. The presence of stagnant waters in the new drains that can result in mosquito infestation and dengue/chickungunya outbreaks. The entrance and exits to Frederick Settlement must be made more functional and easy for the motorists eliminating dangers posed by the Doc’s Wall. These are carelessly designed and need souping up or redoing. The paving of Knaggs Street (East to West) to restore the surface after works were done and the building of a drain to avoid flooding of this Street in front of the Caroni Presbyterian School/Church. The Catholic Church and Presbyterian school ought to be compensated for suffering from noise and dust pollution with a paved roadway in Knaggs Street. No bus-stops and not even temporary make-shift ones for sheltering from the elements in Frederick Settlement, Caroni Village and La Paille Villages. The flooding threat posed by a stagnant, not-flowing Skimming Drain and the drain located on the Eastern boundary of Frederick Settlement that is grassed up. There is a lot of stagnant drains carelessly built to retain stagnant water. The lack of crossings for pedestrians in La Paille Village posing dangers to life and limb and potential accidents. The astronomical increases in taxi-fares and unwillingness of taxis to drop off passengers in Frederick Settlement. It is to be noted that pedestrian lights were installed on the Tuesday morning after the protest and Minister Cadiz visited the residents and held discussions with them on Wednesday with a view to problem-solving and calming their anxieties. Instead of building a walk over they can put in stop lights that residents can use for crossing. It will be much cheaper and more effective, most pedestrians don’t like climbing up stairs and walking across a bridge. As for the stagnant water fresh water sardines are the most effective in eating the mosquito larvae. All the other issues can be easily addressed. Hey folks ,’me think,’ our lifetime Careerist -diplomat,and one time ,anti -PNM eat a fooder ,in Uncle Stephen Kangal,is probably running for office ,as Minister of Works ,or Community development. I mean, this is what,the second article of a similar nature ,he has force fed us ,over the past 2 weeks. The question,some much smarter than yours truly,is ,ain’t he aware that six people were murdered ,in T&T, since the year began? The bigger news should be ,why dem socially comatose Trinis ,aren’t protesting against that? The reality is ,that ,more women ,and Children have been murdered, missing,and endured abuse,and a myriad of violence, against their person,than during the said periods ,of her 5 male predecessors, and what a sad tragedy! There was a time when sleepy ,peaceful tribal towns ,such as Barrackpore, didn’t have to worry about Uzi carrying gangbangers,invading ,and causing havoc.Now ,fast forward to 2015,and it’s open season. Those high powered war tanks ,your PP government, ordered -without tenders- from Yankeeland ,same say,would have made a huge difference ,not only in Lavantille,Upper Gonzales ,Morvant -Never dirty,and Beetham crime dens,but dem more ,culturally stable enclaves ,favored by….de tribe,si? Maybe it’s time for some reverse gerrymandering, since one cannot differentiate between a UNC dominant, PP suburb ,and a pro PNM criminal cesspool. I wonder folks ,if de Tin pan soldier ,would allow hard working ,dedicated police ,and army blokes ,to lock down ,and beat to within an inch of their pathetic lives ,desperate citizens ,in Barrackpore, the same way, such was allowed in Lavantille ,Nelson Street,Diego Martin,and Caranege? Sorry Commissioner Williams, but you ain’t getting that acting label remove ,by Queen Kamla government, since we, de citizens of this nation ,cannot figure out ,who your police people are- Good, bad,or ugly? One second,they are clouting up homeless bums,with mental issues, while the next,they are running willy nilly,into casinos,and high stakes finance clubs ,under de guise of conducting patrols.Who the hell ,is fooling who,here people? Yesterday,I saw a young police conducting ,road blocks in my already neglected Tobago,and performing traffic in a dirty, white Tshirt,and his police pantalones ,and boots -uniform.Go figure! My Commissioner ,Randy Fox Borroughs,of Scot Drug Report ,Flying Squad fame ,must be turning over in his grave ,to see what our Police Service, has degenerated to ,in ….well,just 4 years ,under Brigadire Sandy,Jack FIFA/Queen maker – Warner ,and now Major Griffey,one might add. What next folks,and are you finally mad as hell,are unprepared to take this anymore? Your call!